I've built it like this so I can gravity feed from the HLT (left) to the mash tun (middle) and also so the mash tun is lifted off the floor for easy mashing and emptying. There is no 'hands off' sparging solution in place yet but I figured a hose and slow movement across the grains would suffice for now. The pump is used for pumping from the mash tun to the kettle, then onwards through the plate chiller to the fermenters. 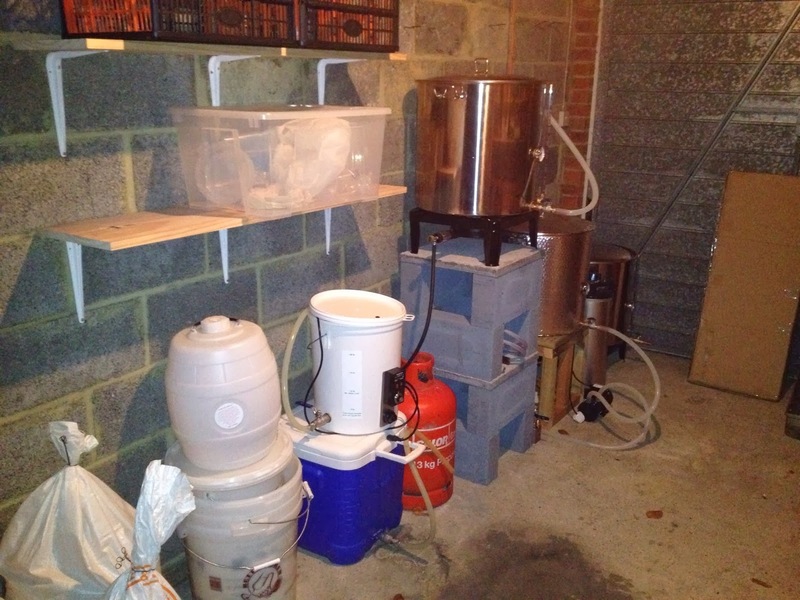 I've yet to invest in a large fermenter (or two!) so for now will be splitting wort across multiple 25 litre buckets. I had a hand getting things set up both from my Dad and oldest, ugliest friend Sean (*waves*). Sean wanted to try his hand at brewing so I recruited him as an able assistant for the maiden brew day! The brew itself when pretty smoothly until it came to transferring to the fermenters, at which point something very strange happened. We lost about 5-6 litres somewhere. It just vanished between the kettle and FV#2! The first thing I'll be doing to figure this out is to calibrate the kettle from a jug or something with a known capacity to see if the sight glass on it is marked up accurately. 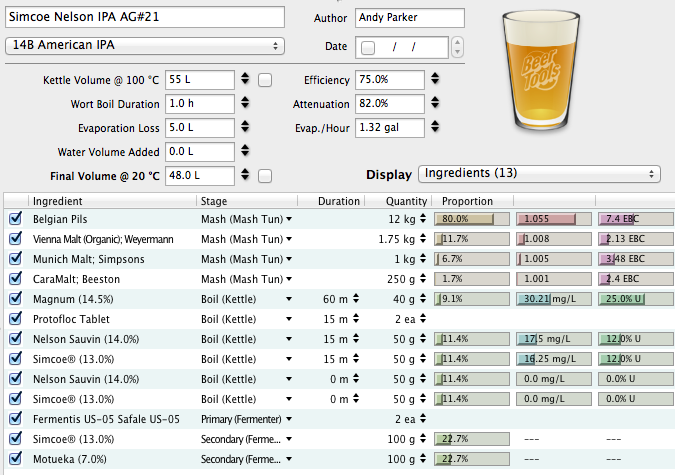 Other than that, efficiency was pretty much the same as my old kit and the only other concern was the temperature loss in the mash tun. I may clad it some more but partly put it down to it only being half full on what was a pretty cold day outside. Post-fermentation and allowing for other losses I ended up with way less than 48 litres of beer but what there is tastes and smells good, so I'm declaring this brew a success. I also had my first encounter with acetaldehyde, at least during my home brewing exploits, which was really noticeable while transferring to secondary. The US-05 cleaned that up though, thankfully. The final mishap came when batch priming the beer for bottling - the battery on my scales had died (note to self: stock a spare!) so I had to guesstimate the weight of the sugar. Seem to have just about got away with that one. It's a touch under-carbonated for my liking but passable for the style.